In USA, 93% of people spend over 25 hours every week listening to their favorite music, and it is estimated that people listen to music more than they watch television. Among those listening to music, 36% of them stream music via online services. These online services are either internet radio or online music streaming services like Spotify, Google Play Music and others. 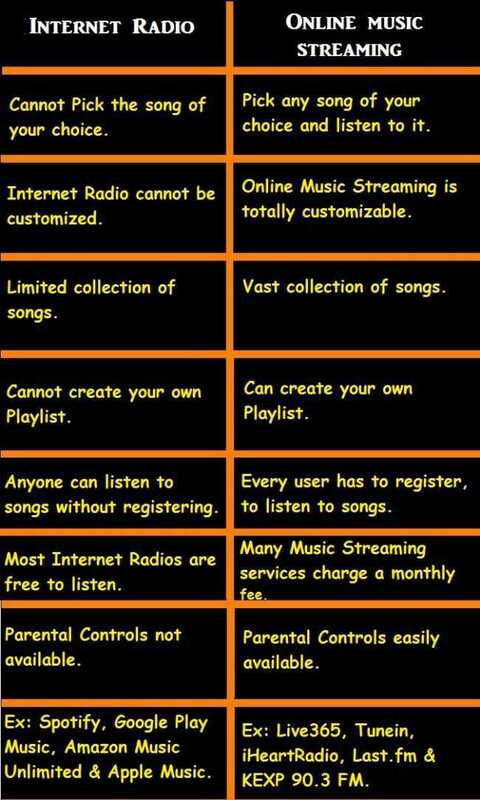 There is a huge difference between online music streaming services and internet radio. Most people might assume they are the same because of the simple fact that they are both accessed online, but that’s not the case. With online music streaming services, you get to listen to what you want anytime you are online. With internet radio, you only listen to what the radio station is playing at that particular time. With online music streaming services like Spotify or Pandora, you can access a particular song immediately. This means that wherever you are so long as you have a good internet connection, you can listen to any song that you want. This is quite the opposite with internet radio. With internet radio, you are not listening to what you want; you listen to what the radio station is playing at that particular time. If you want to listen to a certain song, you can request for it, but it will be played at the will of the radio station. It is not a must that they play the song for you. What internet radio lacks is customization. The ability of a listener to listen to whatever song they want and this is what led to companies like Pandora to make waves in radio entertainment. With internet radio, they don’t have such a vast collection of music like online streaming services. You might want to listen to a particular genre of music from a specific year and album, but that can prove to be hard on internet radio. However, with online music streaming services, you can listen to any song that you want regardless of the genre, artist, music, year or album. Online music streaming services have a massive database of music numbering in the millions. They have every song that you possibly want to listen to, and this is the fun in it. With online music streaming services, you can create your own playlist and favorites list. This is the music that you absolutely love and want to listen to as many times as possible. You can pile up all the music you want and listen to it at any time you want. Remember with internet radio, you can only listen to what the radio station is playing, or you can send a request then wait for the song to play if they get your request on time. There are those songs you really want to listen to more than once. With internet radio, this is not possible, or it might be challenging. Online streaming services give you all the flexibility you want. You can listen to the same song as many times as you wish. You can select the song to be on your favorites list and or your playlist and listen to it anytime you want. With internet radio, you only have to download the app and start listening to the radio and the music the station is playing. With online music streaming services, you have to download the app and create an account becoming a member. The type of music you listen to, access to all the music they have and other things will depend on your membership account. The basic membership requires you only to download the app and create the account. With premium membership account, you create an account, and you have to pay for it either monthly or even annually. There are online music streaming services that allow you to try before you subscribe like Spotify. There are others like Amazon Music Unlimited which are strictly premium services. You can only pay to play. The free accounts, however, have their own limitation. For example, you cannot skip songs in any way you want with a free account. There is a limit of just six songs per hour. These accounts also have ads in audio or video form. The premium accounts, on the other hand, have unlimited song skips, on demand playback, lyrics for every song if you want and many other goodies. Premium accounts are for the members who really want to explore to the core of what a music streaming service offers. The difference between online music streaming services and internet radio is significant and cannot be assumed. More people are today moving to online music streaming services because of the customization bit of online music streaming services. Others call it the freedom to listen to what you want anytime you want and as many times you want and these are the people who are paying to listen.